This post was originally published on May 8, 2009. It was substantially revised and re-posted on January 4, 2016. This gentle, old-fashioned name belongs to a daring, world-changing aviatrix. 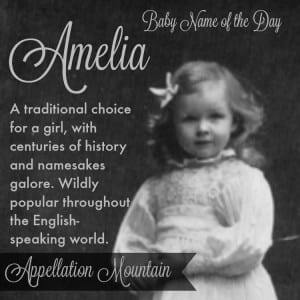 Thanks to Rocking Fetal for suggesting Amelia as our Baby Name of the Day. This single name comes from more than one source. Purists will tell you that both the -elia spelling and Amalia come from the German amal – work, while Emilia and company trace back to the Latin aemulus, rival. But it’s hard to draw a bright line. The seventh century Saint Amalberga is also known by this name. 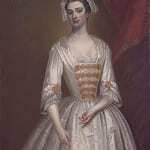 Plenty of royals, especially in the eighteenth and nineteenth centuries, when two British princesses were given the name. The present heir to the throne of the Netherlands is Princess Catharina-Amalia. Sigmund Freud’s mother wore the name. 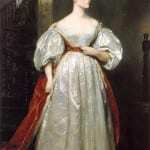 Nineteenth century suffragette Amelia Bloomer lent her surname to the baggy trousers she advocated women be allowed to wear instead of more conventional – and restrictive – clothing. One of the most famous bearers of the name was the daring aviatrix Amelia Earhart. She became the first woman to fly solo across the Atlantic Ocean in 1932. Earhart immediately became a media darling, and a popular lecturer. She was called the Queen of the Air and Lady Lindy, a reference to fellow aviator Charles Lindbergh. Her new fame helped her promote women’s equality, as well as aviation in general. Five years later, Earhart disappeared near Howland Island while attempting a Pacific crossing in 1937. Speculation on her fate has never ceased. Dozens of books have been written about Earhart, but that’s not the reason Amelia is literary. Characters by the name appear in everything from Vanity Fair to Harry Potter. There’s also bumbling, but good-hearted, housekeeper Amelia Bedelia, and it’s the full name of Princess Mia Thermopolis, Crown Princess of Genovia in Meg Cabot’s popular Princess Diaries books. Speaking of The Princess Diaries, the 2001 movie adaptation starring Anne Hathaway as Mia gets much of the credit for the name’s return. 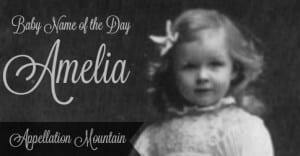 During the late nineteenth century, Amelia was a Top 100 name. By the 1920s, it had fallen into the 200s. And by the 1960s and 70s? The 400s. 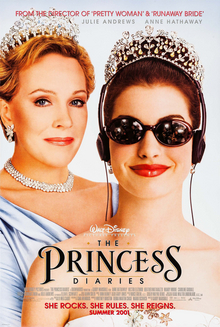 Parents were slowly rediscovering the name when The Princess Diaries came along. The name ranked #207 in 2000. By 2002, Amelia was up to #139, and re-entered the US Top 100 by 2004. By 2014, the name had risen to #15. Nickname Mia, too, was boosted by the popular movie. Besides Mia, other possible short forms include Mila, Amy, Lia, Millie, Mimi, Emmy, and even Molly could work. It’s Minnie Driver’s real name, too. But Amelia requires no nickname, and in our Sophia-Olivia age, odds are that many girls are just plain Amelia. Overall, Amelia is a lovely antique choice for a child. Famous women by the name add some steel to this otherwise delicate and feminine name. The only real drawback? 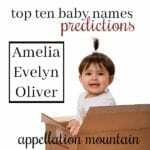 With this name poised just outside the US Top Ten, it’s likely that we’ll meet a lot of little Amelias. Which form of this name do you prefer? Do you know a lot of girls with the name? Portingles-my name is Amalia and my nickname is Mali! The name is grown on me quite a bit, If you have a girl I definitely would support Amalia as her name. :) I have started to love the name Amelie from the french movie-if you havent seen it yet you should, its beautiful! I thought Amelia was unique, yet classic when I decided it was my favorite name about 10 years ago. (I love Amy and would use that as a nn.) Alas, it’s becoming a bit too popular for my liking. I still love the name, though. Amelia Mae would be my pick. It’s a great name, but it isn’t unusual anymore. Then again, an Amelia nicknamed Amy might be different. My daughter is Amelia Kae! (Kae is for my mother in law.) She always goes by Millie, though. We get a lot of compliments on it, and it suits her perfectly. I love Millie for Amelia! Haha I like this post. I have a huge soft spot for it: it’s my baby (okay, she’s 18 now) sister’s name! Amelia Margaret. She’s named after our great-grandmother Lois Amelia and our grandmother Margaret Isobella. She mainly goes by Amelia, but we also call her Mimi and Me-la and Meems. I find it so funny how trendy it’s getting. It was in the low 200s when my Miss Meem was born in 1991. Teachers always called her Amanda or Emily, and she hated it! Even now, as a senior, she’s one of two Amelias in her whole school. As a Kayt/Kate/Katherine, I was so jealous as a child. If I ever have a girl, her middle name will be Margaret, but if we had a second girl, her middle name just might be Amelia. I pushed for Charlotte Amelia to make our list when we were pregnant with James, but the huz hates it! Amelia sat at #15 in my Australian state in 2008, with Amelie at #77. I do rather like her, and my daughter’s mn is Emilia (We chose the spelling because it seemed more visually appealing in the combo?) . Most Amelia’s in Australia go by Millie, I’ve never heard any go by Mia, funnily enough (probably because she’s our #1 name). I much prefer Millie anyway, I kind of despise Mia because of the amount I hear her!! She’s lovely and feminine with a subtle sophistication and I do really like her, plus, she’s easy to spell and say! I agree, I really like Amelie – I have a 4 year old cousin with the name – but people really, really destroy the pronunciation, so she’s out for me! Emilia is so so pretty on paper, it’s a shame it sounds so similar to Amelia. I am also crushing on Amelie and Amalia. But Amelia? It’s always sounded kind of… pharmaceutical to me. I looked it up, and it’s the name of a medical condition – the congenital absense of one or more limbs. But that aside, it has a nice meaning and several worthy namesakes. So I don’t mind the name, but it’s not for me. I am absolutely in love with Amelia! I just worry about her similarity to Emily, I wouldn’t want her to blend in with that crowd. I really love Amelia, though, I’d love to use her. Now Amalia and Amelie are two versions that appeal quite a bit to me though. Amelie is light and lovely, although I know a fair amount of people who’d butcher the pronuncation. Amalia is pudding; rich, lush and simply beautiful. And Molly doesn’t seem that that much of a stretch when I say it: ah-MAHL-yah. […] sounds like popular girls’ choices Amelia and Olivia. […] Euphemia is both in step with Olivia and Amelia, but still completely different. 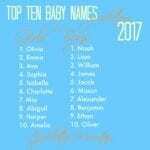 […] for a child’s name, but it helps that Azalea sounds an awful lot like Top 100 picks Amelia or Natalia – three syllables, elaborate, but not overly frilly. […] 1000 after the 1940s, but has attracted some attention of late. […] this is suitable a boy name, too.